This is written for all of you who have ever felt uncomfortable because of someone coming on to you during a dance. If you’ve ever felt trapped by the duty to be polite or worried about the consequences of disengaging from a situation that was “only” discomfiting, you’ll want to read on. However, there will be descriptions of sexual harassment and mention of sexual assault. Please consider that before you continue. I was inspired to respond to this question as it fits in with a few articles I have written recently that look at how to make our dance scenes more welcoming, respectful, and positive about consent. As much resistance as we face confronting situations of clear trespasses of consent, it’s extremely difficult to address how to handle situations where there hasn’t been any behavior that clearly deserves condemnation. So let’s be clear what we’re actually talking about here. This isn’t a question about not enjoying dancing with beginners or anyone who sticks to basics. It’s also not about turning down a dance with someone you know behaves inappropriately. 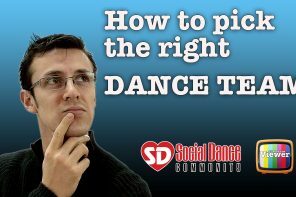 Perhaps most important to clarify: this isn’t about whether you enjoy talking while dancing – although when I posed my own version of Meagan’s question on my social media, I quickly found out that an incredible number of people just hate all conversation on the dance floor. Here we are considering how to deal with someone whose conversation focuses on physical compliments and/or attempts to maneuver you into making one-on-one plans, while they are holding you close and barely dancing. Yet they haven’t done anything that definitely crosses a line. Sure, any one of us can endure four minutes of such behavior and walk away at the end of the song without damage. Except this is rarely an isolated experience. It’s not four minutes once a month. It’s not even four minutes once a week. For many of us, it happens every time we go out dancing. And if we’re still open and willing to dance with everyone, it’ll likely to happen more than once in a night. Think about walking through a large shopping mall. There are numerous vendors in kiosks in the middle of the hallways. There are salespeople trying to hand you a brochure, offer you a sample, and generally pull you in so they can sell you something. They stand in your path so you have to either engage with them or detour to avoid them. Most of us are used to this sort of thing. But imagine that happening not just on the occasions you go to the mall, but every time you walked anywhere. How would it affect your way of moving through the world if every time you wanted to go somewhere, there were pushy salespeople trying to get something from you? Let’s bring that idea back to the dance floor. We’ve come out to dance, but don’t really want to deal with the “sales pitch” coming from our dance partner. Not only that, this is the kind of behavior that very often leads to unwanted, inappropriate touching – “copping a feel,” as Meagan put it. I have personally experienced everything from caresses on my face, fingers massaging my lower back, pelvic grinding, kiss on my neck and deliberate hands on my breasts or the seat of my jeans, far more times than I could possibly count. And given how normal it is for my friends to complain of similar experiences, I know I’m not an isolated, unlucky case. Far too many have also shared stories of sexual assault. Unfortunately that mean I’m going to be quick to pick up on any signs that might indicate I’m headed towards sexual harassment. Regardless of whether the person is a predator or just someone who has never learned about respecting boundaries in the dance, I’m going to start dancing and speaking defensively. I may also choose to end the dance mid-song. I simply can’t give everyone the benefit of the doubt, because that puts me at too much risk. I wanted to see how other dancers feel about these kinds of situations. 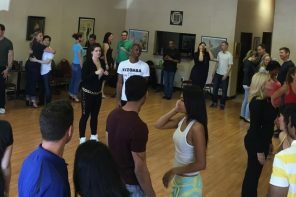 I asked for input on a few different corners of Facebook and received comments from Brazilian zouk, blues, lindy hop, kizomba, salsa and tango dancers. Thanks to people who were willing to share their words more publicly here, you’ll get to read advice from a wide range of people. I think it’s worth saying up front that things will necessarily vary widely by scene. For example, tango communities don’t generally encourage any talking on the floor, let alone pickup behavior. Kizomba has long been a close embrace dance, which can make the range of error for “holding too close” much more narrow. That’s in addition to our own individual varying levels of comfort, both with people who are clearly after something other than an enjoyable dance, and with speaking up or taking action to assert boundaries. If someone is making you uncomfortable, the most certain way of getting back to a dance you can enjoy (or at least tolerate) is to talk about it. “For one thing, it will tell you something about their character if you think they are answering honestly. It can also lead to fairly intellectual/unattached conversation about the dance scene, etiquette, and being kind and polite to each other. Trying to talk with the dancer in question in these kinds of situations can admittedly contribute to your feeling even more uncomfortable. You have to evaluate for yourself if you feel safe confronting them, especially if your scene hasn’t paid much attention to these kinds of issues. Sometimes the cost-benefit analysis might tell you to endure until the end of the song. In other situations the best option is indeed to end the dance early and walk away. Since this article has already gone long, I invite you to come back next month for more ideas on how to respond when your dance partner is making you uncomfortable. We’ll look at a variety of subtler options, both verbal and physical, that enable you to mitigate or even escape your discomfort while avoiding confrontation. In the meantime, share your own experiences and advice with us in the comments! Thanks also to David Hendershot for invaluable advice on my writing and consenting to my using his image out of context. If you come to a point where you don’t feel comfortable dancing with your partner, say so, don’t just try to gently hint non-verbally. Examples in the article show you can do it in non-threatening ways. How many warnings/chances you choose to give your dance partner before you walk off the dance floor mid-song is up to you. But I strongly encourage that it should be at least one. Unless you have definitive proof that someone is acting on purpose and have ignored other dancers requests to stop that behavior, you should be polite and not assume anything. It might be someone new to the dancefloor/scene and who hasn’t gotten the feel for what is acceptable or even that they are doing something inappropriate. Just walking away without telling them what is wrong and offering them the chance to improve is bad for everyone, except perhaps you who got away. So be polite, it is and should always be a part of any dance community. And when someone has been shown politeness and choose to continue their undesireable or predatory behavior, do what you can to get them out of the community. As I said, dancing should be fun and a good time… for all involved parties. I think a response like “Let’s talk less so we can focus on dancing, and use more of an open connection” would get the idea across politely. If the partner gives you a hard time at that point, say “Thank you.” and end the dance. 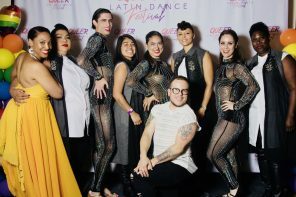 At a recent big latin dance event in Australia I noticed that the females appeared to be slapping the male’s butts at will and regularly. The males looked a bit startled. Has the tide finally turned?